Switzerland’s democratic constitution is fashioned in such a way that, provided at least 100,000 nationals sign up to a single idea, public proposals can be turned to referendum. The system has so far seen Switzerland reject nuclear power, curb executive pay, and narrowly reject the 1:12 initiative in late November, which would have stopped monthly executive pay exceeding what the lowest paid staff member earns in a year. This public privilege has been exercised to near exhaustion in recent months, however, with many citizens expressing concern at what appears to be a self-perpetuating system of income inequality in Switzerland. While, at first glance, this particular niggle appears altogether absent from the world’s second-richest people, Switzerland is without a minimum wage law and the country’s top one percent lay claim to over a third of the nation’s wealth. This sickly state of affairs has riled what has historically stood as a predominantly middle-class population, which has long averted the crippling high and low ends of the spectrum. Contrast the agricultural wealth of years gone by with today’s 366 households worth more than $100m and a land that plays host to 10 percent of the world’s billionaires, and you begin to share some sympathy with the largely disillusioned population. Resident corporate entities such as Nestlé, Novartis and UBS are customarily chastised by the masses for implementing a get-rich-quick scheme of doing business. This all too often stinks of corruption and conflicts with Switzerland’s longstanding sense of equality. Switzerland’s popular initiative system has prevented the wealth gap from widening further still. Swiss grassroots activists collected more than 130,000 signatures from people who agreed every Swiss national should be given an unconditional CHF2,500 (approximately €2,032) a month – otherwise termed an unconditional basic income. If the motion were to pass then a basic income would serve as a system of social security. Swiss nationals would receive a staple monthly income on top of any salary they are earning and irrespective of their current employment status. 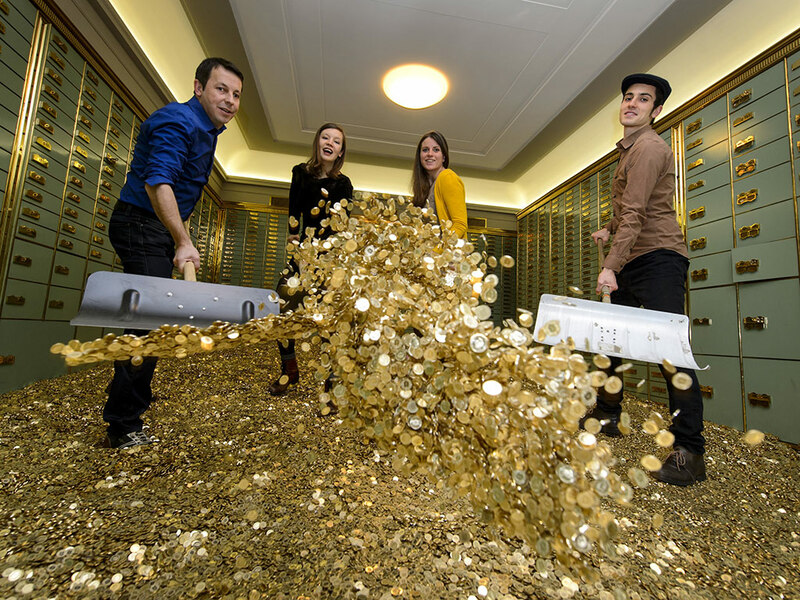 At the rate of CHF2,500, a basic income system would drain a third of Switzerland’s overall GDP, strip the clout of national government and afford even more power to the people on how they wish their money to be spent. The beginnings of the system can be seen with the emergence of a negative income tax, which was proposed as far back as the 60s by libertarian-conservative economist Milton Friedman and was then without the ‘unconditional’ tag. Although the proposal was found to be entirely unfeasible and deemed unworkable by politicians, motions to implement a similar system have gained ground in recent months as the existing welfare framework has come under renewed scrutiny. Vast swathes of cash are funnelled towards alleviation of poverty in Europe, yet the sad fact is it remains a constant blight on communities and economies throughout the region. Proponents of basic income draw attention to the costs of welfare administration. They believe cutting out the middlemen could, in large part, produce enough money to introduce a basic income and prevent the population from falling into desperate circumstances. “It would simplify all current social security systems – making them far cheaper to administer, easier to understand, less prone to error, bureaucratic capriciousness and fraud,” says Barb Jacobson of the European Initiative for Basic Income. The sheer amount of money proposed as part of the Swiss initiative only serves to underline the radicalness of the idea and what a huge change it would be. Granted, basic income may well be the only sure-fire way to prevent a discrepancy between those who have and those who have not, but the system is foreign to ruling political parties and has its complications. The overriding criticism of basic income is that it could actually act as a disincentive to work. Moreover, certain parties claim that giving money to people without the guarantee they will contribute to the economy is morally objectionable. In response to these criticisms, various experiments have demonstrated that, far from disincentivising work, basic income can actually boost productivity. The so-called ‘Mincome Programme’ ran from 1974 to 1979 and saw the system implemented in Dauphin, Manitoba in order to ascertain whether or not guaranteed income would inhibit productivity. The results proved the only two groups whose work rate dropped by a significant degree were new mothers, who spent more time with their children, and teenagers, who largely dedicated more time to studies and further education. Regardless of the pros and cons, basic income is unlikely to pass in Switzerland. This is not to say the work done on this front will be without consequence. The very fact the idea has made it to referendum is a credit to Switzerland’s political system and the egalitarian initiatives it so often inspires. Irrespective of the outcome of the referendum, the circumstances surrounding the proceedings to this point highlight the openness of Switzerland’s political system and demonstrate to neighbouring European nations that there are alternative models of governance worth considering. Is unconditional basic income the reform Europe needs?